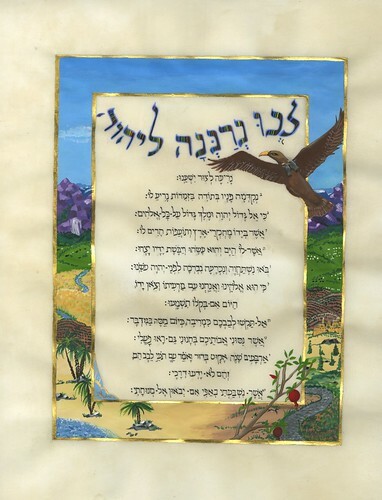 The ketubah is part of a tradition stretching back to Shimon ben Shatach, the first century BCE sage who first required contractual protection of both husband’s and wife’s rights and obligations toward each other. 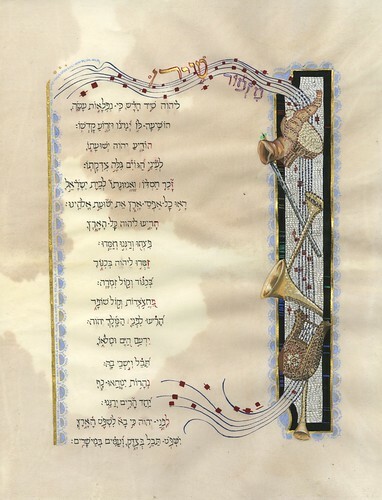 The traditional Aramaic text used today is the formula codified by the sage, Rabbi Gershom the Light of the Exile, in the eleventh century Rhineland. The conservative movement has added a clause prepared by Dr. Saul Lieberman relating to divorce rights. In the American Jewish community it has become frequent practice to include a modern egalitarian English text, expressing the couple’s ethical and romantic pledges to one another. In the Reform movement, such egalitarian texts, presented in modern Hebrew and English, frequently replace the traditional formulation. The egalitarian texts used here were composed for me by Dr. Arnold Band, the eminent scholar of Hebrew literature. 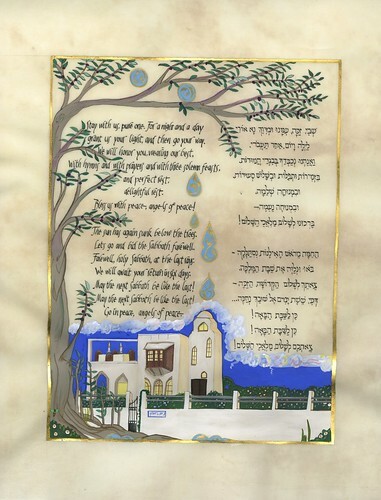 The artwork surrounding the ketubah texts celebrates the warm and loving home inaugurated by the Jewish wedding. The flowers and fruit presented against the blue and gold border symbolize qualities found in the Jewish home. 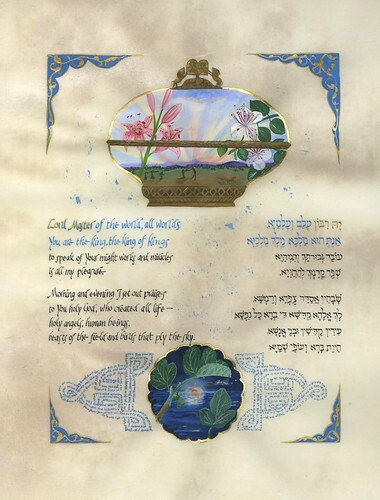 In midrash, or rabbinic legend, roses, lilies and narcissus are associated with a variety of virtues, including physical loveliness, the beauty and sweetness of the Commandments and humility. 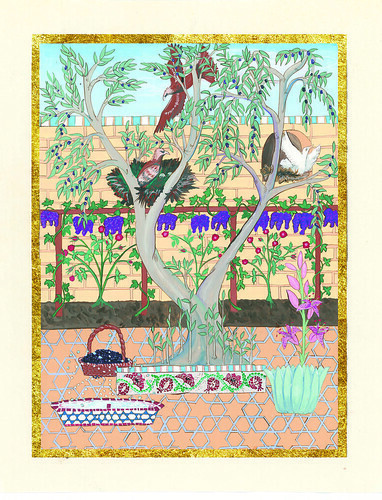 Olive branches symbolize nobility, fruitfulness and peace in Biblical texts. The spray of roses, shown in bud, full flower and fruit additionally represent the life cycle. 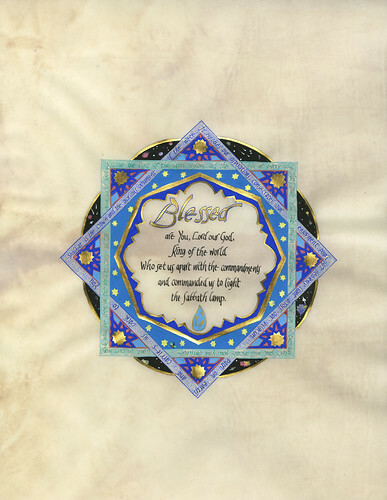 Throughout Jewish lore and ritual grapes symbolize joy and sanctification, while wheat speaks of sustenance. Throughout Jerusalem, sprigs of the caper plant spring from the driest stone walls, producing buds and fresh white blossoms daily. In the Babylonian Talmud, the caper plant’s ability to thrive in the face of adversity is compared to Israel’s own perseverance. 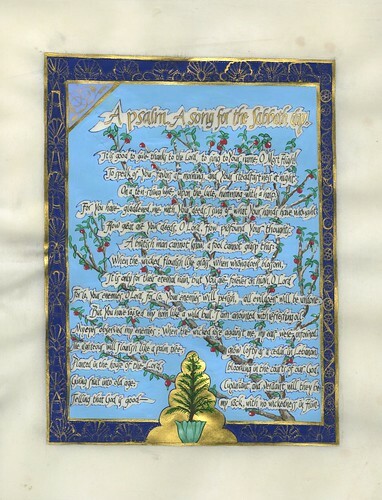 The flowering and fruiting almond branch draws upon the story in Numbers 17 in which Aaron’s wooden staff miraculously sprouts almond leaves, blossoms and fruits, demonstrating the legitimacy of Moses’ and Aaron’s leadership of the people. The pomegranate has been the ubiquitous Mediterranean symbol of fruitfulness for millennia; in addition, the early rabbis of midrash asserted that the pomegranate bears exactly 613 seeds, thus tying the sweet seeds to the number of mitzvot in the Torah. 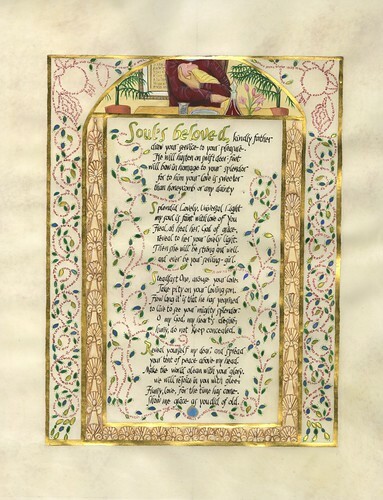 The Loving Home Ketubah is available in basic and deluxe versions for any text variant. 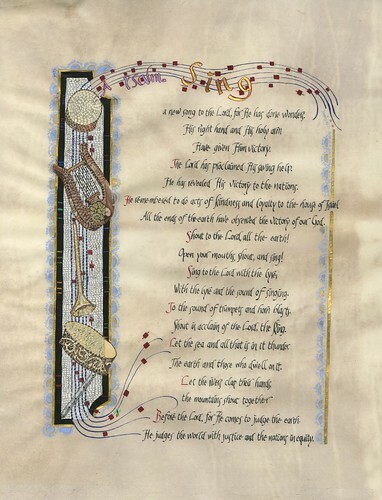 A deluxe version, with by-hand papercuts (same design) and a 22KT gold-leaf initial word, is available for an additional $150 over the price of the basic version. The price for any of the above versions is $250 US. Personalization is available for any of the with-text versions for $75 US; 2-4 weeks notice is necessary, although faster service and express shipping are available for a rush fee. The fee for adding a complete customized text to the no-text version will be determined by me upon reviewing the customer’s desired text. The cost of shipping within the continental US is $25. Please contact me for further ordering information. Payment may be made by personal check or credit card, at your convenience.